Directions: All applicants for a New Jersey driver license must have all required documents to satisfy the 6 Point ID Verification. A vision screening is required for all motorists. The Motor Vehicle Commission may refer applicants with impaired vision to a physician. Periodically, the Motor Vehicle Commission may require a vision recheck of a New Jersey motorist. The knowledge test consists of 50 questions, plus a survey question about organ donation. In curves and on hills. Next to churches and schools. At intersections and pedestrian crosswalks. Stop lines are solid white lines painted across traffic lanes at intersections and pedestrian crosswalks. They indicate the exact location at which approaching drivers must stop. Swing to the right side of your lane. Wait until oncoming traffic has a red light. When turning left at a traffic signal, you must yield the right-of-way to pedestrians and oncoming traffic. Stop and rest every two hours. Do arm exercises every hour. Drive with one eye open at a time. Change feet on the gas pedal. To avoid becoming fatigued while taking a long trip, stop every two hours for a short break. If you become drowsy, pull off the road and park in a safe place to take a nap, or find a room to stay for the night. Locations where it is unlawful and unsafe to pass another vehicle include hills, curves, intersections, and railroad crossings. Drive with caution and be ready to slow down. Do not drive in this lane. You must come to a complete stop and yield the right-of-way. Slow down, be prepared to stop, and, if necessary, yield the right-of-way. 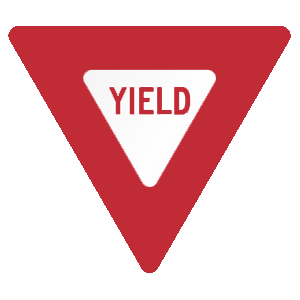 This type of triangular sign means drivers must yield. You must slow down as you come to an intersection marked with this sign and be prepared to stop. Let any other vehicles, bicyclists, or pedestrians pass safely before you proceed. What does a flashing yellow traffic light mean? Come to a full stop. A flashing yellow traffic light indicates that you should drive with caution.